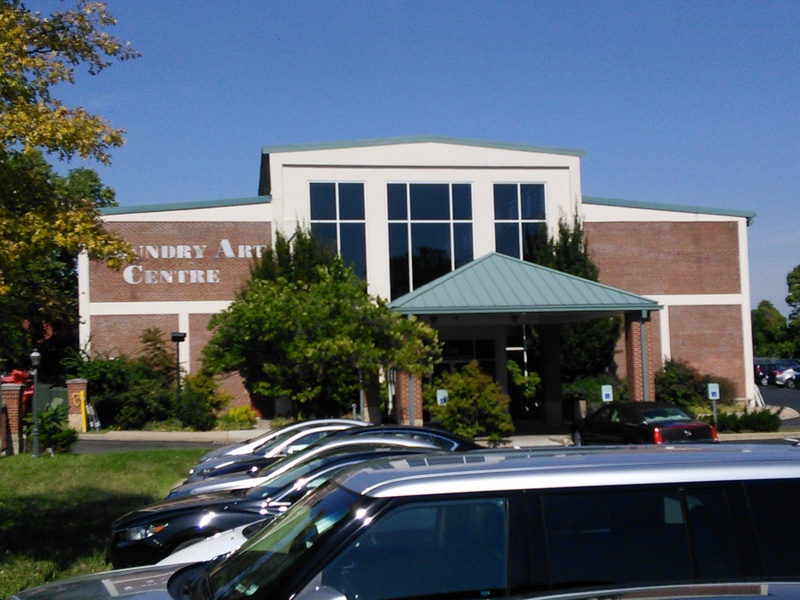 The Foundry Art Centre in St Charles, Missouri. 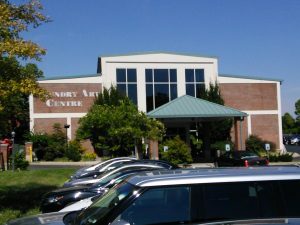 The Macro Micro exhibit was on display in the Foundry Art Centre in St. Charles, Missouri from August 17 through September 28, 2018. For this exhibition, size matters. This show will display two opposites: one half focusing on small works (micro) and the other half focusing on works larger than 48 inches (macro). This exhibition is open to all two-dimensional and three-dimensional media and themes. Open to all artists 18 years & older, world-wide, both amateur & professional, working in all styles & schools of thought. This includes alternative and traditional artwork. 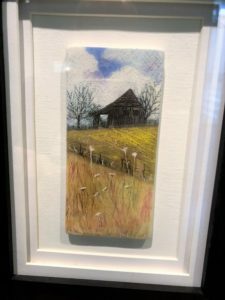 Jennifer has been painting watercolor on ceramic tiles for years. On a gallery site she states: ” “Nature is my muse and plein air painting my passion. I paint the world around me hoping to capture those small perfect moments that make me grateful to be alive”. 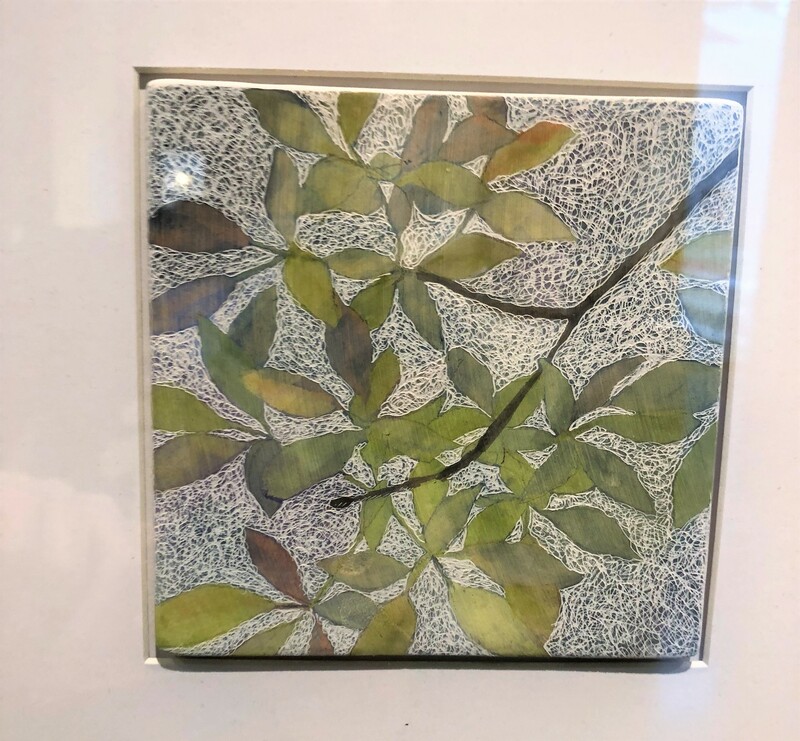 It was striking to see how different watercolor looks on a tile vs. on paper. 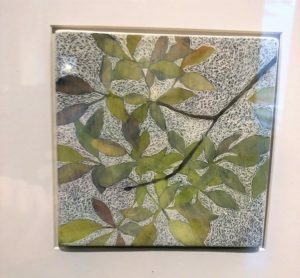 The tile seems to absorb rather than allow to flow the paint, and that allows for sharper, better defined shapes and details. 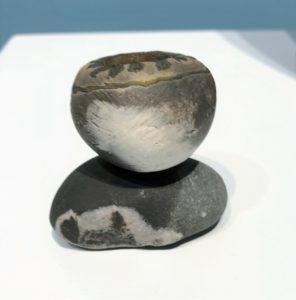 The piece from the outside looks almost like a roughly-shaped, nearly abstract composition of support and a vessel.